The way we produce energy today requires water – a lot of it. Nearly all of the global electricity generation is considered water intense. With a rapidly growing world population, the demand for both water and electricity is set to increase dramatically. How can we ensure enough water for energy and enough energy to provide clean water? That is the challenge that the new Global Network on Sustainable Water and Energy Solutions is determined to tackle. The Network, which will be launched by UN DESA, ITAIPU Binacional and other partners at the COP 24 climate conference this month, will promote integrated approaches to the water‑energy nexus. 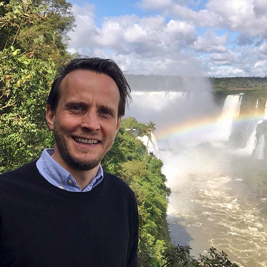 We talked to Nicolas Franke, Sustainable Development Officer at UN DESA. Why is the link between water and energy so important? “Water and energy are highly interlinked, but these linkages are rarely recognized and often neglected. Our institutions tend to address the problems of energy and water separately, working in silos. Meanwhile, water is essential for most energy production systems, with 90 per cent of global electricity generation having intense water requirements, and energy is essential to distribute, purify and recycle water. Can you give us some examples of such integrated approaches? “The solutions that address the water-energy nexus will depend on geographical conditions and regional requirements. There are no silver bullets. One good example is wastewater, which we can use to generate energy, not only increasing energy availability, but also reducing the pollution of our water resources. A growing population means a greater demand for water and energy while growing global temperatures mean less availability of water. Is there a way out of this vicious cycle? “We have to learn how to live with nature and make use of our limited resources in an efficient, equitable and sustainable way. I believe that we need to create regenerative systems that would allow us to reduce the quantity of resources we use and of the waste we produce by closing the water cycle and narrowing the energy loop. This month, UN DESA will launch a new Sustainable Water and Energy Global Network. How will it make a difference?